Pyrography is how a design is put onto the wood. This craft has been done on timber since the Middle Ages when hot metal pokers were heated in a fire and then designs burnt into timber. A new poker had to be used every couple of minutes once the heat released itself from the tool into the wood. Bowls, drinking goblets, kitchen utensils and furniture etc were embellished. These day a hand held metal wire with a cool handle is continually heated and the design is burnt into the wood by hand. Unlike stitching if you make a mistake while burning you can not unpick the mistake. So a steady hand and concentration is needed. This toadstool house I turned on a wood lathe in two pieces. Then I did the pyrography. The wood is still drying so it will be interesting to see if the house looks like it has been in an earthquake with cracks in a couple of months. I left the tenon on top and hollowed it into a birds nest. The inside I hollowed out to make a hidden treasure space. 24cm tall. Macrocarpa wood. The egg cup below I turned on a lathe, but I decided it looked more like a mini goblet. So I did this pyrography design onto it and added some copper leaf. 8.5cm tall. Wood turned Kauri plate below is 15cm wide. Pyrography, copper leaf, acrylic paint. Janet’s original design. The koru (fern frond) in New Zealand Maori culture is a sign of new life and growth. In my design, the woven thread through the koru shows the life force of a person. The sections in the koru show life is an evolution of parts that have layers to each stage. The background is based on a kete (woven flax basket). It is believed that our knowledge learnt in life is stored in our own internal kete. I burnt on two feathers and painted gold metallic paint to highlight the wooden bowl I hand turned on a lathe. 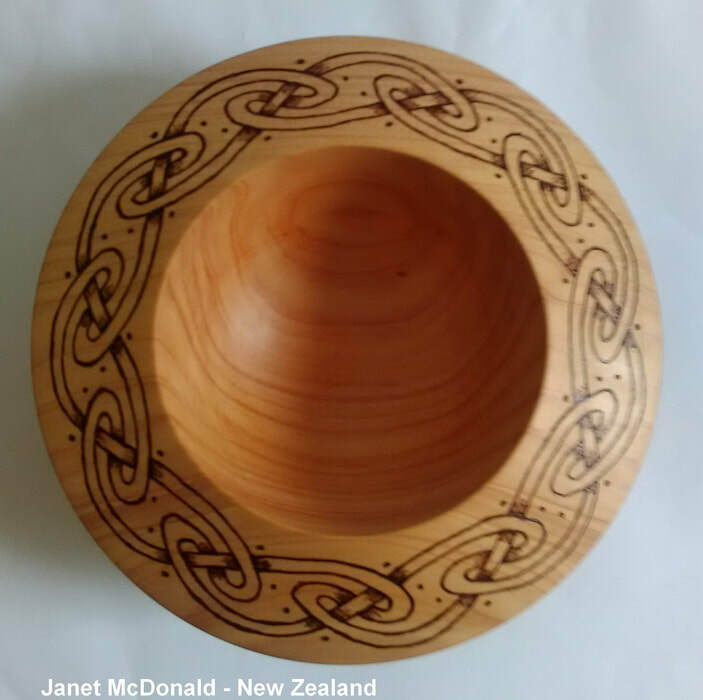 The wood is Macrocarpa and the bowl is 22cm wide. In 2018 I have started doing woodturning on a lathe. After doing pyrography on bowls and other wooden objects I found in second hand shops, I decided to make my own wooden objects to burn designs onto! I turned this wooden celtic bowl on a lathe myself. I began by practicing making holes with my carving tools in the edge piece of a wooden bowl I had turned. The bowl edge had broken off as it had lots of cracks in it…. My creativity then jumped in with some pyrography and gold paint. 15cm long. These 3 chopping board are all different sizes. I changed each design to fit each board. The long board is 35cm long. The round ones are 25 and 35cm round. .
A recycled Arcadia wooden bowl that I designed a retro Scandinavian design for. 30cm wide. This Koru (fern frond) design I originally did up for a paper and ink design. Now I have burnt it on a pot stand 14cm wide. I love searching second hand shops for hand turned wooden objects. This container with lid, looked rather sad on the shelf with no polish to it. But after doing pyrography on it and varnishing, it has come to life. It is 11 cm tall. Living in New Zealand it was only a matter of time before I did some wood burning that was Hobbit related. The box is 15cm wide. The wooden box below I purchased and designed a theme of New Zealand and Pacifica for a friend to hold his vaping tanks. The box is 25cm wide. The wooden platter below my father hand turned on a wood lathe many years ago. So for my sisters 60th birthday he gave me the plater and I drew up the thistle/celtic design and burt onto the plater. 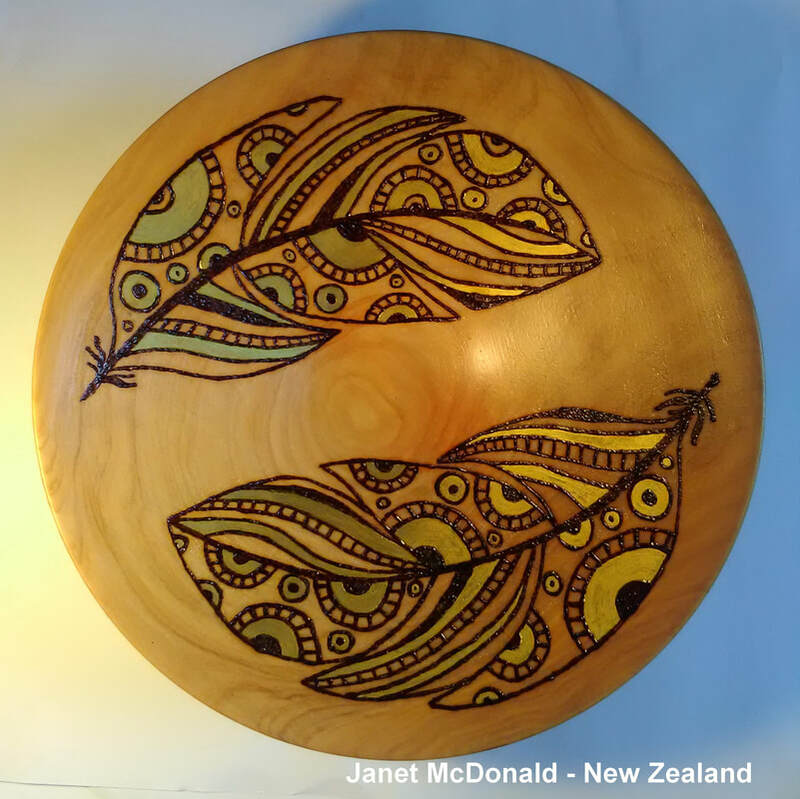 The platter is 36cm (14 inches) wide.The wood is Rimu a native wood to New Zealand. I gave this wooden crate below a New Zealand Summer feel to design. The design has been hand burnt (pyrography) onto the cedar wood. Then two layers of varnish to seal and a rope handle each end. The crate is 40 x30cm and 18cm high. Among the design you will find…. Baby silver fern fronds, Southern Cross stars. fish, seaweed, seashells, the New Zealand Pohutukawa flowers, ocean waves and sand. The plate above is made from New Zealand pine. The owl I recreated in pyrography from a Needlework design I designed and hand stitched. The plate is 20cm wide. I based my designs on this recycled bowl after the mehndi style of design. 9cm across the top.Made from New Zealand Pine timber. It has been sealed with 3 layers of varnish. These can be used as a drink coaster, hung on the wall or free standing on a shelf. I based the design of this dish on paisley fabric designs. Note the two thimbles among the design. Made from recycled New Zealand Pine Timber which has been hand turned on a lath. It has been sealed with layers of varnish. The dish measures 20 cms (8 inches) across. Edge depth 2 cms (3/4 inches). This dish being from recycled timber it may have a small blemish/s in the timber that adds to its natural charm. 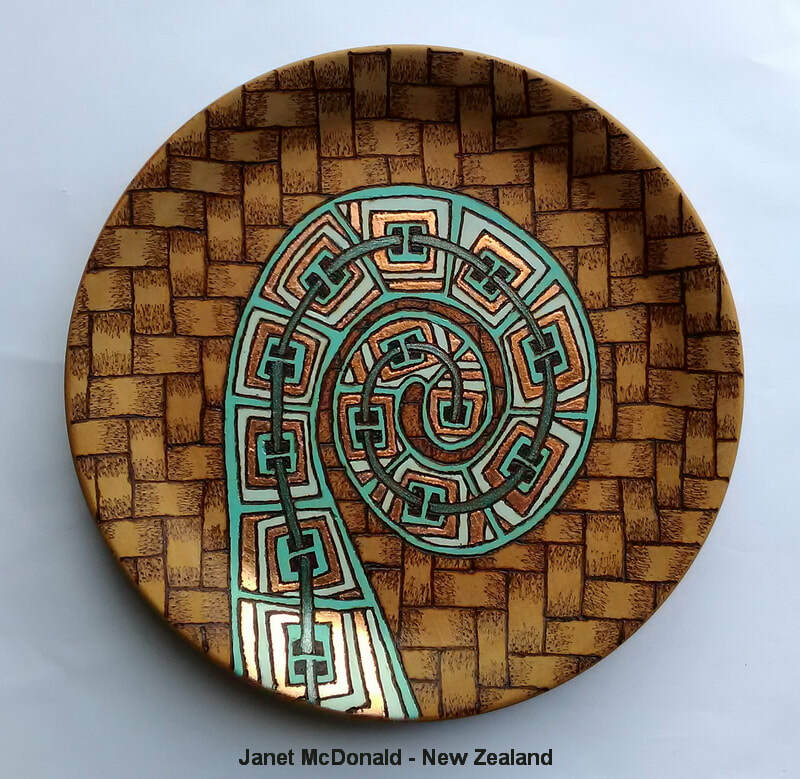 I based the design on this dish around a Celtic knot design. Among the knots you will find buttons, beads, needles, thread and cotton reels. Made from recycled New Zealand Pine Timber which has been hand turned on a lath. On the left is my Scottish Thistle stitched in Padded Needlelace; the design is 15 x 16 cms (6 high x 6 ¼ wide inches) in size. On the right is a wooden teapot stand I made adapted from my Needlelace design; The plaque measurements are 14cms (5 inches) square. Thickness 2 cms (3/4 inches). This Pincushion has flowers, leaves and berries engraved around the edges. On two corners are thimbles I have engraved some initials and year. On the opposite corners are cotton reels. 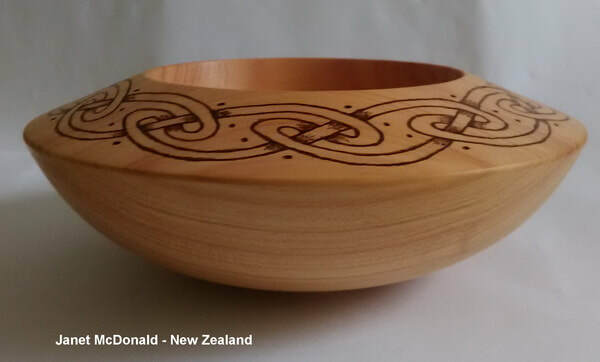 Made from New Zealand Pine Timbe, it has been sealed with layers of varnish. The wood measurements are 14cms (5 inches) square. Thickness 2 cms (3/4 inches). This Pincushion has needlework floss, beads, buttons and needles engraved around the edges. On two corners initials are ingraved. The wood measurements are 14cms (5 inches) square. Thickness 2 cms (3/4 inches). This pyrography pot stand measurements 14cms (5 inches) square. Thickness 2 cms (3/4 inches). It was made as a joke.